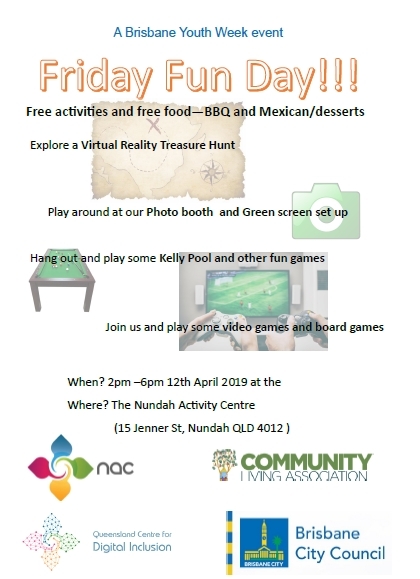 Fun Day Friday will be on 12th April from 2 to 6pm, just across the rail at Nundah Activity Centre. Fun Day Friday is an activity designed by young people with an interest in gaming, technology and meeting new people. The day will involve a range of different activities for young people to participate in and try on the day. These include virtual reality, pool games, video games. The development of the technology room has provided an opportunity for young people to connect to the space as the room has technologies such as 3D printer, virtual reality, green screen and film technology which they are interested in. There will be free food and a BBQ available. Please invite all and sundry!